Eventough I wanted to visit the hidden places and the nice cafes who have good ambiance, I choose to go to the mainstream places that really popular amongst Indonesian. I saw many of friends took pictures in this streets. Haji Lane is like the hippest street in Singapore with so many cute little stores, cafes, and mural. It’s just a small alley in Bugis Area, but as you entered, you will feel like you are in a different world. I learned from the internet, that Haji Lane during 60s and 70s era was lodging area for pilgrims and poor families, that is why they named it Haji Lane. Haji means a Muslim who’s completed their pilgrimage to Mecca. Around 2001, the street started to revive. Now, the street is filled with avant-garde shops, fancy cafes, and cute murals. I went to Haji Lane around 12pm and it was really hot. It wasn’t really difficult to find the street, because we could see the street just around Masjid Sultan. As I walk the street, I found that most of the stores were closed, I don’t know why. From what I saw in the internet, Haji Lane usually packed with people, but it was contrarily during my visit. I tried to find the famous mural wall that I saw in my Instagram timeline. The mural located in the end of the street, in front of a cafe. There were cafe table and chair around the mural. Two table were even attached on the mural wall, so I can’t take any proper photos. As I walked, I see any other mural, but it was not really interesting. I also didn’t paid any visit to the stores around or any cafes, because I was afraid the prices will be over my budget. I personally think that Haji Lane is a bit overrated. But, I put my photos there anyway, just like all the people. When I visited Singapore back in 2013, I visited Gardens by the Bay, but only on the admission free outside garden. When I revisited it this time, I want to see the conservatory area and see their holticultural collection. I bought the ticket online, to avoid any queue, even tough the queue there wasn’t really long. The conservatories area (Flower Dome & Cloud Forest) admission fee for non-local residents was S$28. I chose to go to Flower Dome first. Visiting Flower Dome is just like being in the spring, with all the plants and climate. The information said that in this area, there were exotic plants from five continents. I really like it here, because the atmosphere was really nice and cold, even tough that time Singapore was very hot. Flower Dome was also bright, because the building is an award winning greenhouses. The vivid coloured flowers also added up the beauty of the conservatory. They displayed the plants and flower collection in thematic ways, like South African Garden, Californian Garden, Succulent Garden, Mediterranean Garden, etc. You could also see the African Baobab, which is the largest tree in there and weigh more than 32 tons. I like this tree, because it is so unique. After spent a good one hour in the Flower Dome, we move to the Cloud Forest conservatories. We were greeted by this spectacular waterfall right after the entrance, that give me an awe. The waterfall splash give me a cool sensation. We took a photo in there, but be careful so you are not gonna slip. We went to the highest floor to see the waterfall and to take more photos. Trust me, there are so many photo spot in there. Like under the circular bridge, overlooking the glass wall. I took so many pictures in every corner. I really like how the sunlight came in through the glass wall. If you an acrophobia, maybe the high floor is not your option, but try to overcome your fear, because you will get a lot of nice photos! In the afternoon, you could sit in the Bay East Garden. I did this and just people watched. It is nice to see people running, cycling, or just petting their dog. You could also get a nice photo here with Singapore Flyer background. At night, we decided to watch the Garden Rhapsody. It is located in the Supertrees Grove and started at around 7.45pm everyday. You could see the beautiful lights dancing with music in this show. The best way to enjoy this show is to lay under the Supertrees Grove! Have you ever saw a photos of someone with shiny light background? Also photo of someone that covered in a beautiful shadow? I saw this kind of photos in my Instagram, a lot. I adore this kind of photos, so when I saw the location is in Singapore, I decided to give it a go. ArtScience Museum is located in Marina Bay Sands complex. Before I go here, I decided to window shopped in The Shoppe @ Marina Bay Sands. After that, take the exit in Ground Lobby and from there you can see the unique building of ArtScience Museum. There are a lot of exhibition in this museum. You can check their current exhibition on their website. I chose to go to Future World exhibition because I’ve been curious about their futuristic art installation. Future World exhibition in ArtScience Museum is permanent, but their collection might change overtime. The Future World exhibition divided into four categories, nature, town, park, and space. As I walked into the exhibition arena, my adventure began on the nature. Just on the left on the entrance, there was this cool installation named Crows are Chased and the Chasing Crows are destined to be Chased as well, Transcending Space. This is an audiovisual installation that features crows that fly around on the space and creating beautiful pattern. I was astonished by how beautiful is the installation and the audio. Next is the Instagram-famous Black Waves installation. 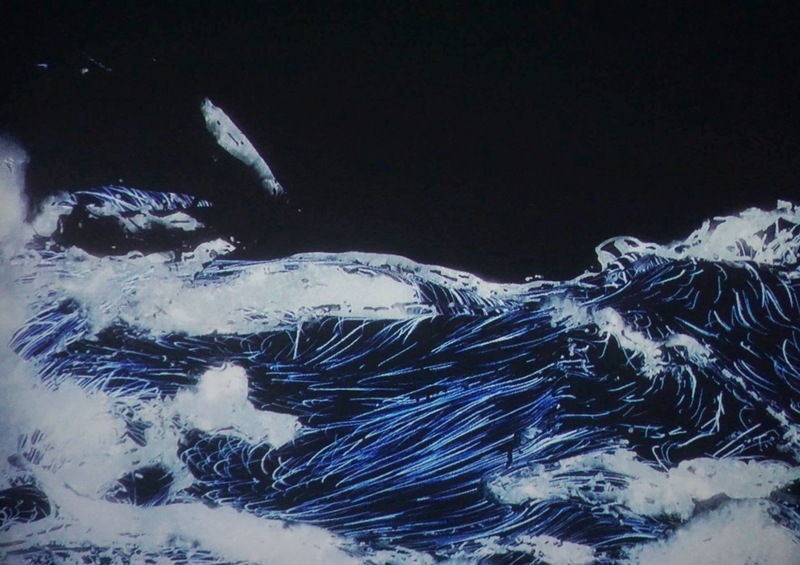 The installation features a graphic of sea in traditional Japanese painting. The 3D environment give us the ambiance of waves movement. You can take a lot of pictures here or just sitting and enjoy the art. Step outside the Black Waves, I then played on the Sliding Through the Fruit Field. This area is meant for the kids, but I’m a kid at heart, so why not playing around? As I slide down the slope, the flowers and fruit grew. The Town area is a futuristic urban setting that intended for kids. My favorite installation from this area is Sketch Town where I could color some pictures, scan it, and see my masterpiece floating around the futuristic town screen. I don’t play around the other installation in this area, because they were so many kids. I immediately move to the Park area, where my journey continued in a more natural way. My most favorite installation is the Universe of Water Particles. This installation feature a 7-metre tall virtual waterfall. Other installation that catches my sight was Sketch Aquarium, a virtual aquarium where I can create my own sea-creature and feed them by touching the screen. The last area is Space. The one and only installation in this area is Crystal Universe. This installation is a space filled with LED light that gave illusion about stars in the space. When you touch the light, the color will changed, the blink and the music is also adjust to its own color. I was so fascinated by this installation. I love love love it! My visit to Future World exhibition is so much fun. I can play around and also got so many futuristic pictures. PS: I also paid a visit to Into the Wild exhibition by WWF. In this free exhibition, I could play in an virtual adventure that transformed the whole museum to a virtual rainforest. The good thing is, for every virtual tree planted in this exhibition, WWF will planted a real tree in Indonesian rainforest. Play with a good cause! I put any other places in my itinerary as Instagram photo hunting, such as Central Perk Cafe, Yayoi Kusama exhibition at National Gallery Singapore, Chijmes, and Old Hill Street Police. But, due to budget, time, and energy, I cancelled those following list. That means, I have to go back to Singapore to explore more Instagram worthy spot lol.